The 20th grandmaster of Muso Jikiden Eishin-Ryu Iaijutsu, Miura Takeyuki Hanshi, was born January 5, 1922 in Shimane-ken, Japan. At the age of eleven, he entered the Budo Senmon Gakko, a martial arts training school, where he began his study of Kendo, the modern art of Japanese fencing which has its roots in Samurai swordmanship. 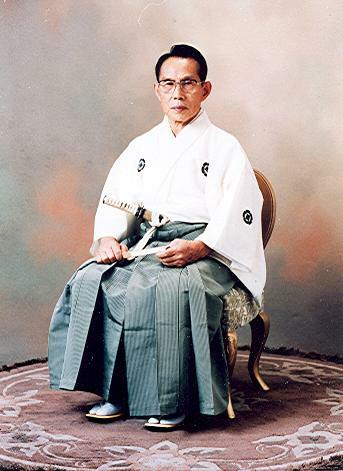 Although it is probable that he studied elements of Iaido during his Kendo training or under other instructors, Miura Hanshi began his study of Muso Jikiden Eishin-Ryu Iaijutsu in 1959 under Narise Sakahiro who was the president of the Dai Nippon Iaido Yaegaki-kai and who became the 19th grandmaster of the style. Miura Hanshi also received instruction from the 18th grandmaster, Masaoka Kazumi. One year later, Miura Hanshi began his training in Shindo Muso-Ryu Jodo under Nakajima Asakichi, who was then the most senior disciple of the 25th grandmaster of the style, Shimizu Takatsugu, under whom he also trained. Following this, Miura Hanshi began studying Koryu Kakushu Bujutsu (“Ancient Samurai Weapons”) in 1965 under the 3rd grandmaster of Enshin-Ryu, Kobashi Nikkan. This system includes a variety of traditional Samurai weapons. In May 1970, Miura Hanshi undertook the study of Kukishin-Ryu Bojutsu under the instruction of Kano Takehiko, the 11th grandmaster of Yanagi-Ryu. In May of 1975, culminating more than forty years of martial arts training, including over fifteen years of Iaido and other Samurai weapons, Miura Hanshi founded the Nippon Kobudo Jikishin-kai. He established the Hombu dojo (headquarters) for Nippon Kobudo Jikishin-kai on the grounds of Yasaka Jinja, in the Yasaka district of Neyagawa City in Osaka. Among the rankings currently held by Miura Hanshi are 8th dan in Koryu Kakushu Bujutsu from the Zen Nippon Kobudo Sogo Renmei (awarded May, 1975) and 10th dan Hanshi in Iaido, conferred in 2004 by the Dai-Nippon Butoku-Kai. Miura Hanshi is held in such high esteem that in 1977 he received an 8th dan in Toyama-Ryu Batto-Jutsu (the modern military form of swordsmanship) without having requested such ranking or even joining the organization. In addition to being its highest ranking living member as 10th dan, the Dai-Nippon Botuko-Kai has designated Miura Hanshi as ‘Iincho’ (Executive Director) for Kobudo Shinsa (rank testing in weapons), Kobudo Kenshu (weapons seminars) and Taikai (championships). In April, 1985, the Butoku-Kai named Miura Hanshi “Yushusho” (Most Valuable Member) and he had served on it’s Board of Directors since April, 1990. During his many years of teaching, Miura Hanshi had also been recognized for his community contributions with such awards as Honorary Mayor of Kyoto City in April 1988 and Honorary Governor of Kyoto-fu in April, 1993. 1933 – Entered the Budo Senmon Gakko at the Busen for the study of Kendo and other Samurai Arts.